It was so cold that winter that the snow had turned blue (The Winter of the Blue Snow, they called it). 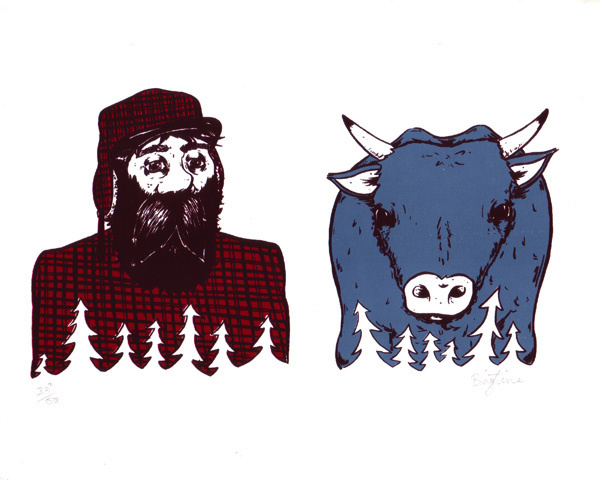 Paul Bunyan was taking a walk in the woods when he found a baby ox nearly frozen. Even after he warmed it up, the critter stayed as blue as the snow. Paul fell for that baby ox and decided to take care of it forever…thus, Babe the Blue Ox. Being raised in Paul’s camp, Babe grew to epic (literally) proportions. Though he certainly made a name for himself around the camp, it wasn’t until he started helping out with Paul’s logging jobs that his fame grew to match his size. For Babe’s first truly incredible feat, Paul hitched him to the crooked logging roads and had him tug until he’d pulled them tight, creating a straight shot to the lumberyards and leaving enough leftover road to lay some down into new timberland. 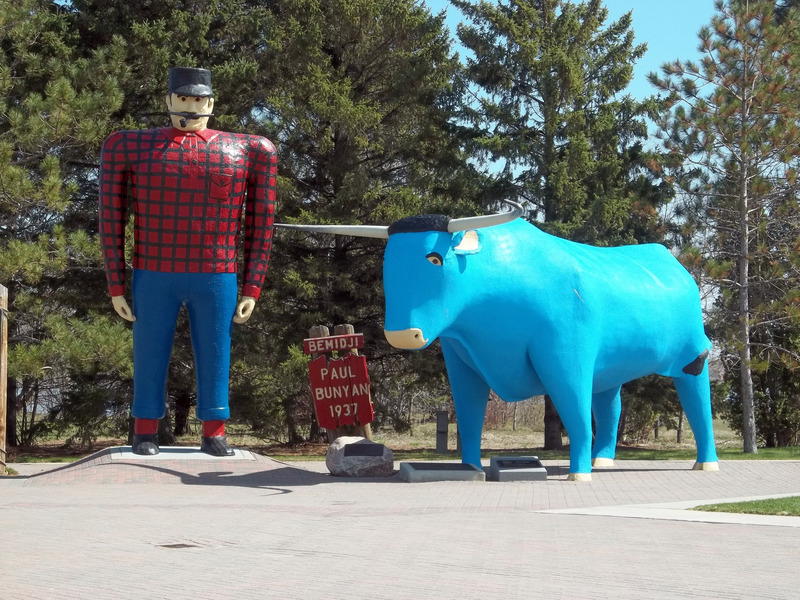 There are as many stories about Babe the Blue Ox and Paul Bunyan as there are people to tell them. Although there is speculation that the seeds of the legend may have been sown during Canada’s Papineau Rebellion, most sources agree that the stories first circulated orally in logging camps starting around the 1880s. James McGillivray is credited with the tales’ transition into print, publishing selections in a Michigan newspaper in 1906 and four years later expanding them in a long rhyming story called “The Round River Drive” (Babe appears in TRRD, but not by name). But Paul and Babe didn’t hit the big time until 1914, when William Laughead (Loghead?) of the Red River Lumber Company commandeered them for a new line of work: advertising. The logging industry had fallen on hard times, and Paul and Babe were the icons that could give it a lift. Featuring stories and illustrations of the lumberjack and his ox, Laughead’s Red River Lumber pamphlets reached beyond industry insiders and made their way to a wide readership. Laughead was also responsible for saddling the ox with a permanent moniker. By 1922, Paul and Babe were household names. Who made Paul Bunyan, who gave him birth as a myth, who joked him into life as a the Master Lumberjack, who fashioned him forth as an apparition easing the hours of men amid axes and trees, saws and lumber? The people, the bookless people, they made Paul and had him alive long before he got into the books for those who read. He grew up in shanties, around the hot stoves of winter, among socks and mittens drying, in the smell of tobacco smoke and the roar of laughter mocking the outside weather. And some of Paul came overseas in wooden bunks below decks in sailing vessels. And some of Paul is old as the hills, young as the alphabet. mind that how a user can know it. So that’s why this piece of writing is perfect. Thanks!